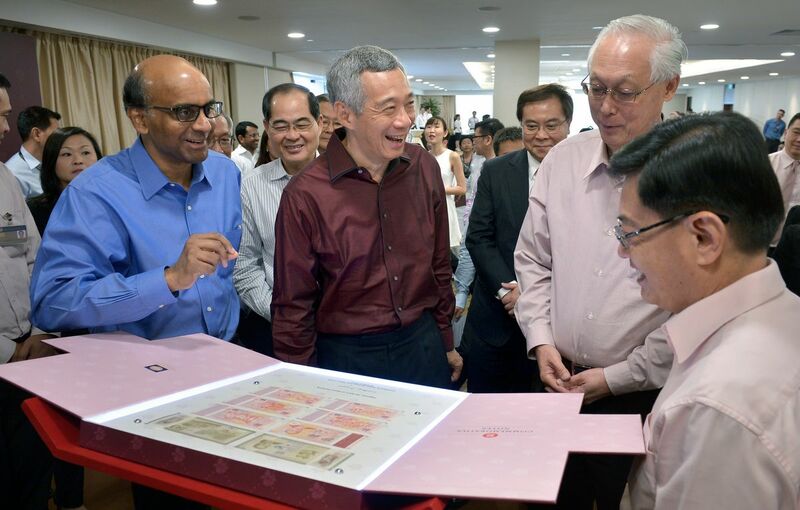 A set of six commemorative $50 and $10 notes with designs depicting significant milestones and achievements in Singapore's history was launched yesterday. 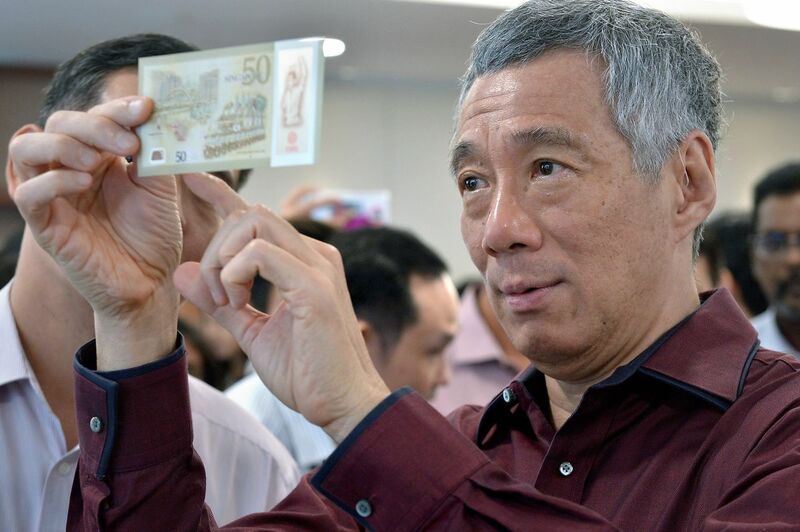 The set, issued by the Monetary Authority of Singapore (MAS) to mark Singapore's 50th birthday, comprises one $50 note and five $10 polymer notes, and will be available at banks from tomorrow. 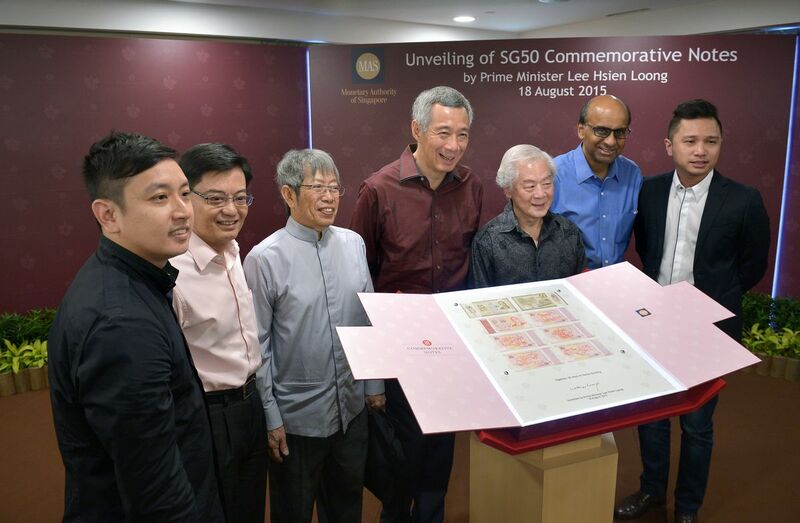 This Golden Jubilee year is "a time to reflect on our shared history and sacrifices of our pioneers, to reflect on the values that brought us here and to pledge to preserve and uphold these values", said Prime Minister Lee Hsien Loong at the launch of the set of notes at the MAS building in Shenton Way. 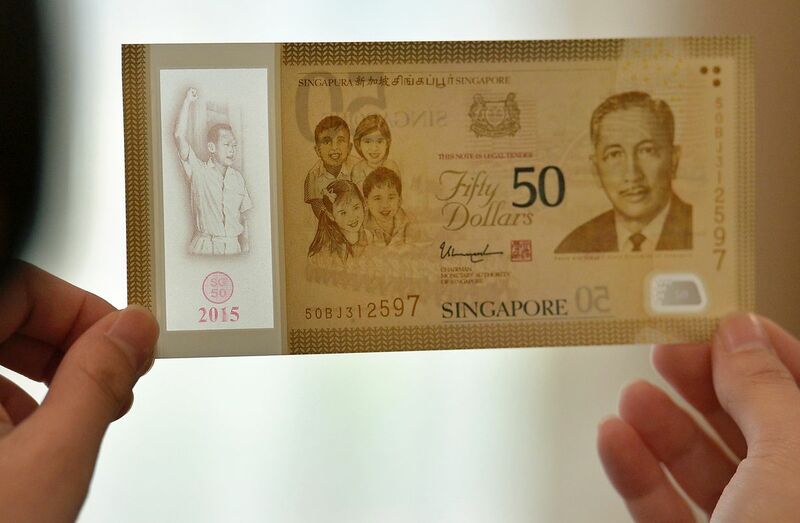 The gold $50 note has a transparent panel showing the late Mr Lee Kuan Yew, Singapore's first Prime Minister, with a raised fist, leading the crowd with a rallying cry of "Merdeka! ", which means independence in Malay. The event marked the achievement of self-government by Singapore in 1959, and was a major milestone to independence in 1965. 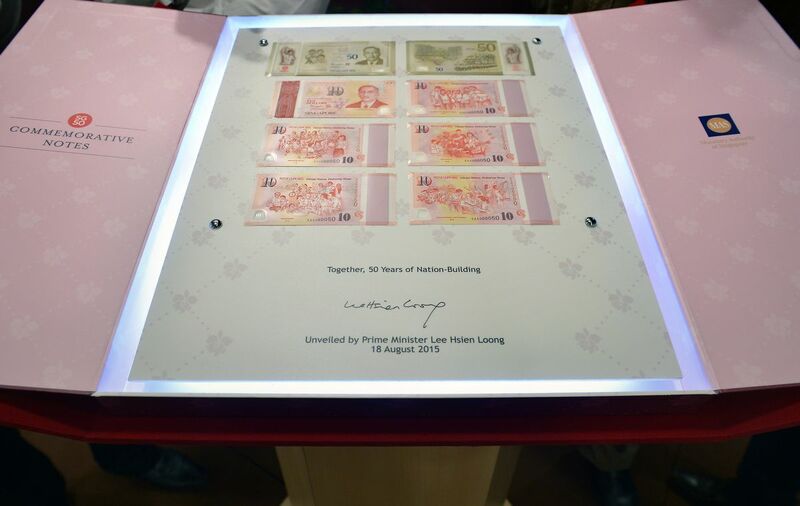 The back of the note features the first National Day Parade on Aug 9, 1966, and the latest new town of Punggol. 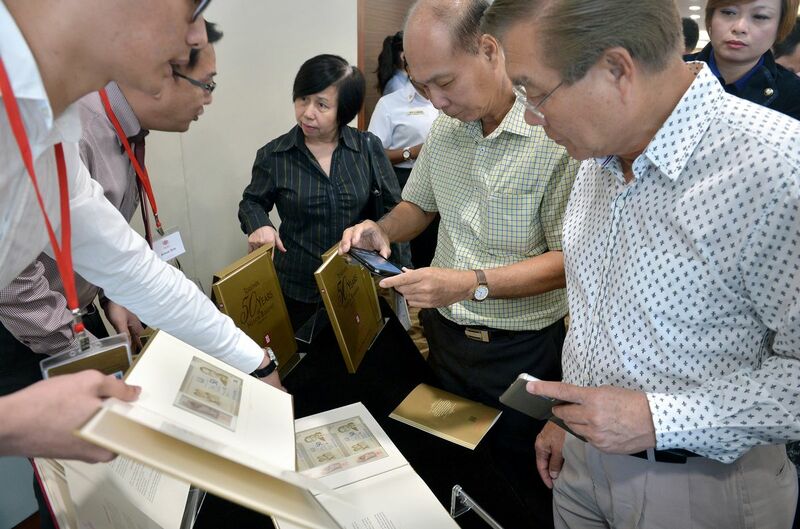 The note's gold colour reflects the country's Golden Jubilee, MAS said. The five $10 notes have a common front design and varying back designs reflecting values and aspirations such as multiracialism, meritocracy, peace and stability, strong families and active citizenry. Like the current series of notes, all the SG50 bills feature a portrait of Singapore's first President Yusof Ishak on the front. But the new notes have security features that are the first of their kind to be used on a currency note, said MAS. For example, the $50 note has a security stripe featuring the numbers "1965" that switch to "2015" when held at a different angle. The notes were designed by four local artists and designers - Mr Chua Mia Tee, Mr Eng Siak Loy, Mr Weng Ziyan and Mr Fabian Lim. The public can get the commemorative notes at the branches of nine major retail banks from tomorrow by exchanging the mat face value. These banks include DBS Bank/POSB - which will be extending the opening hours of its branches till 8pm on weekdays for the next two weeks - and OCBC Bank, which has employed additional manpower to manage the crowds expected. Customers of UOB can reserve the notes online and collect the mat a later date. Each individual will be limited to a quota of five sets of notes. 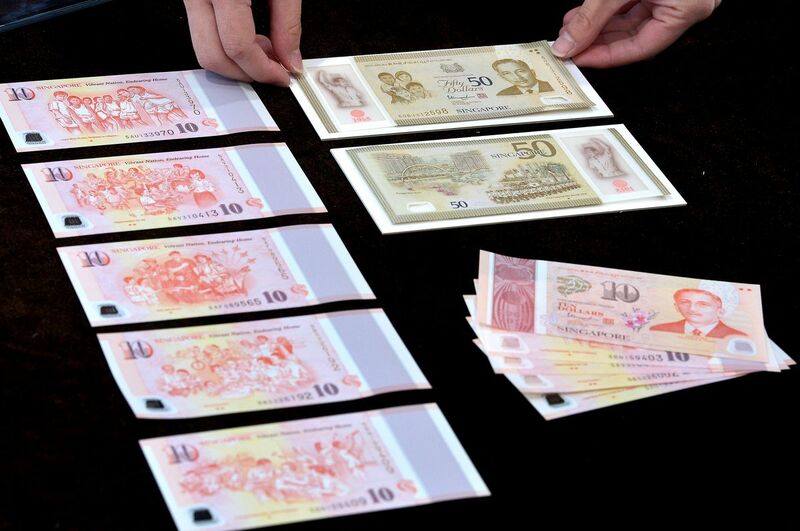 Singaporeans will be given priority to exchange the notes from tomorrow to the end of next month. They will have to present their identification card at the bank as proof of citizenship. The notes will be available to non-Singaporeans from Oct 1. Dr Andrew Khoo, deputy managing director of corporate development at MAS, said: "There will be enough SG50 notes available for exchange. There is no need to rush." A total of 20 million pieces of $50 notes and 75 million pieces of $10 notes - 15 million pieces of each design-will be printed, he said. 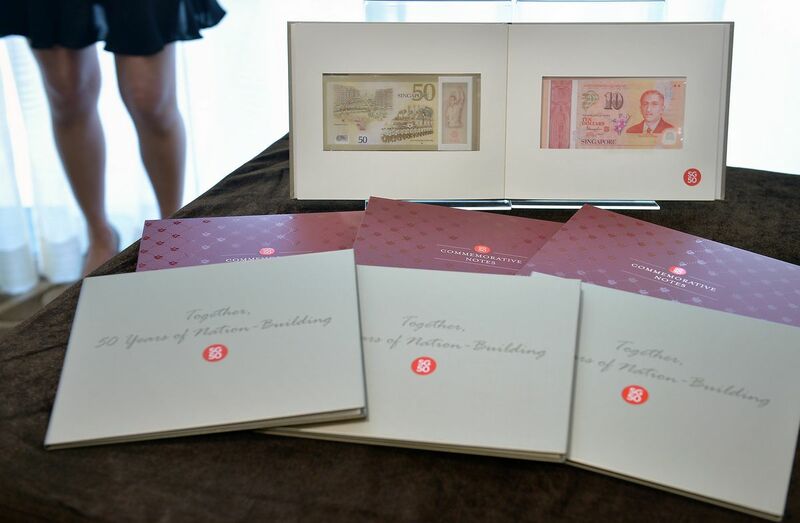 The notes complete the set of currencies issued by MAS to mark SG50, which include a set of three commemorative coins that were launched in April.